Converter for LED – Govena Lighting S.A.
connect the LED sources with a rated voltage 12 VAC. 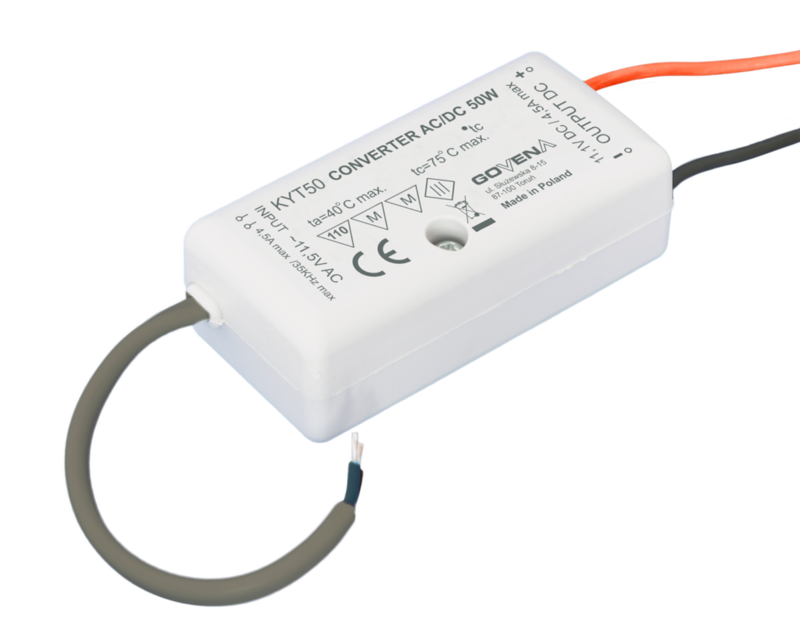 The Converter AC/DC should be connected only with Govena’s electronic transformers YT50/YT60, YT70 and YT105. It is possible to use Converter AC/DC with YT150, YT210 and YT250 by connecting several converters in parallel to the electronic transformer output (with uniform load per converter). Auto – Recovering Protection: overload circuit, temperature and short-circuit (YT electronic transformers). Govena’s electronic transformer YT with the Converter AC/DC can by used for the adjustment of the LED light intensity by applying light dimmer. For best compatibility use intelligent transistor dimmers which cut off the mains voltage towards the end of sine wave (trailing edge dimmers).